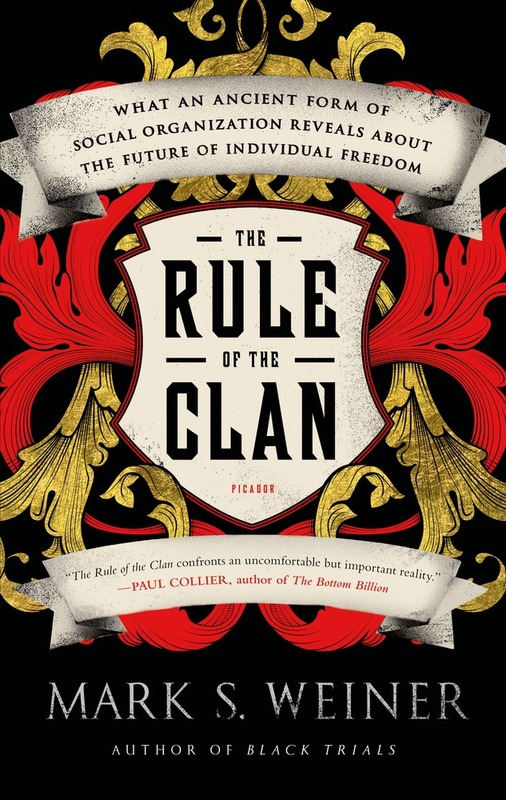 I recently read Mark S. Weiner's The Rule of the Clan: What an Ancient Form of Social Organization Reveals About the Future of Individual Freedom. I heartily recommend the book, which includes various case studies--the comparison of the largely contemporaneous consolidation of state power against claims of kin, clan and lineage in Anglo-Saxon England with Arabia under Muhammad and the Rashidun Caliphs was particularly striking. 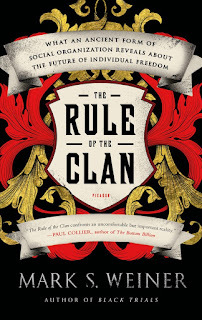 Though Weiner seems to have largely missed the role of the Catholic Church's family revolution (such as banning cousin marriage) in the fading of clan in Latin Christendom. Traditionally, social and political power among Palestinians has been rooted in systems of lineage. These kinship systems include not only those of nomadic Bedouin tribesmen and the elite families who served as intermediaries between the Palestinian population and government administrators under the Ottoman Empire and the British Mandate, but also hundreds of extended family groups of hamula, tracing their patrilineal descent to a common ancestor (loc 1342). ... continue to play an important part in Palestinian politics and the administration of justice. In particular, clans possess their own tribunals for resolving disputes within their lineage groups, and they abide by time-honored practices for reaching reconciliation and renewal (islah) between disputing groups under recognised principles of customary law ('urn). 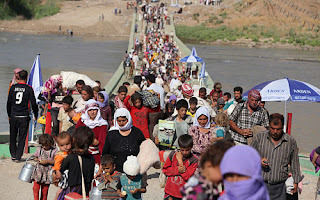 They also observe a strict code of honour (mithaq al-sharaf) that requires members to take revenge (tha'r) against those who have injured their kin (loc 1342). The viability of a free and independent Palestinian state will depend not only on Israeli political will, but also whether these traditional systems of justice can be replaced with state institutions under democratic public control (loc 1355). ... it gave rise to a new generation of leaders known as the intifada elite, university-educated activists committed not to the interests of their kin groups but to the principles of nationalism. The intifada elite sought to advance the cause of Palestinian independent by developing the institutional structures of government and civil society. Their deep, grassroots connections gave them the authority and legitimacy to construct a modern, albeit revolutionary, state (loc 1355). To bolster his own power, Arafat undermined the institutions forged by the intifada elite and strengthened the power of the clans, which he could control directly through patronage (loc 1355). produced what is was designed to produce: a parliament of clan leaders, largely pliant to the wishes of Arafat and his cabinet (loc 1368). ... clans now pose a major obstacle to practical institution builders seeking to establish the rule of law in the Palestinian Authority (loc 1368). The obstacle has been as vexing to the Islamists of Hamas in Gaza as it has been to the nationalists of Fatah in the West Bank. Although Islam has historically accommodated clan groups, at its heart it sets religious identity against tribal loyalty. Hamas is philosophically committed to this anticlan ideology, which regularly brings it into violent conflict with powerful Gazan families (loc 1382). But both Arafat and Hamas found conflict much easier than peace-building. Especially as it is such an excellent revenue source: the Hamas leadership appears to have become seriously wealthy from its anti-Zionist intransigence. The existing Palestinian elite had a choice: come to some mutually beneficial arrangement with the new settlers (Palestine was hardly crowded at the time) or play the ethno-religious hatred game. Some of the Palestinian elite was willing to do the former, even if it was just selling land to the newcomers. Enter the new Grand Mufti (1921-1937) of Jerusalem, Mohammed Effendi Amin el-Husseini. Already implicated in anti-Jewish violence, he propagated an Arab nationalism that excluded the Jews--yet Jews had been residents of the region longer than Arabs. 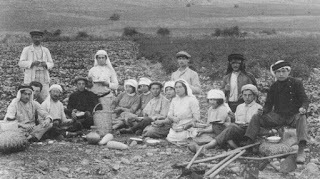 Hatred and violence pushed the Jews towards creating their own institutions, while defining a new Palestinian identity against Jews. 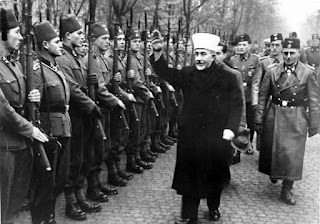 Zionism was based on the principle that Jews were not safe in Europe (which turned out to be true), el-Husseini's approach made state-Zionism seem an increasingly necessary refuge in the Middle East as well. The 1929 Riots and even more the 1936-39 Arab Revolt further accelerated both processes. 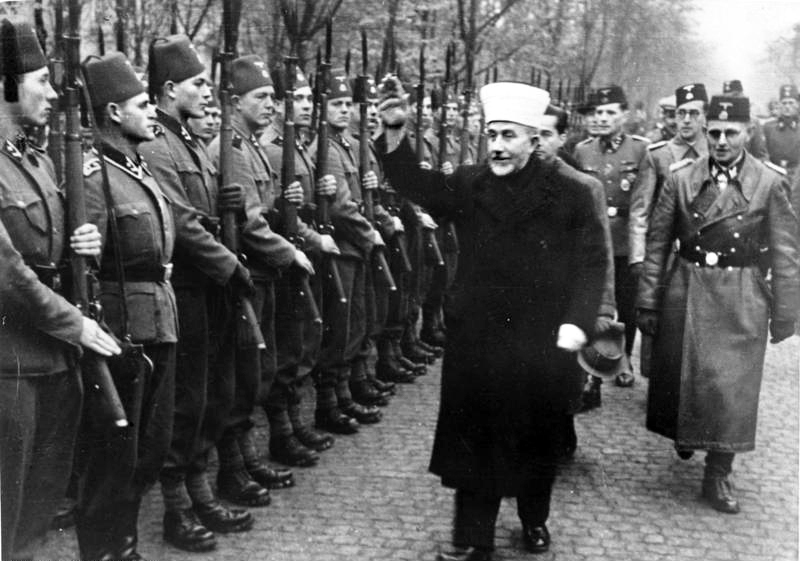 Fleeing a British arrest warrant, el-Husseini ended up in Nazi Germany, actively supporting the Nazi war effort and a policy of expelling all Jews from Muslim countries (including Palestine). His continuing policy of no-compromise and no-place-for-Jews failed to build effective Palestinian institutions but greatly helped motivate the creation of Jewish ones. Culminating in the creation of Israel, the 1947-48 Israeli War of Independence and the fleeing or expulsion of hundreds of thousands of Palestinians (events known to Palestinians as the nabka, the catastrophe). It was record of utter disaster, which lost el-Husseini any credible leadership but never seems to have led to serious reconsideration among Palestinians--it was all the Jews' fault. His post-nabka All-Palestine Government was a shadow, lasting as long as it was convenient to Egypt and no longer. In 1964, the Palestinian Liberation Organisation (PLO) was formed. By 1969, Arafat became Chairman, a position he held until his death in November 2004. His only real achievement was survival. The War of Attrition (1967-1970) led Arafat's PLO to disastrous conflict with Jordan. Fleeing to Lebanon, the Palestinian military presence helped destabilise the weak Lebanese state, leading to the Lebanese Civil War (1975-1990). Once again, the PLO was driven out, this time to Tunisia in 1982. The adoption of the PLO's Ten Point Program neither reassured the Israelis that negotiations could be serious nor united Palestinians, since the Rejectionist Front objected to any implied recognition of Israel. Based in Tunisia, Arafat was far from Palestine and seemed increasingly irrelevant. Arafat was rescued by the First Intifada, which he seems to had nothing to do with. He negotiated the Oslo Accords, which allowed him to return to Palestine and proceeded, as noted above, to undo the best hope for an effective Palestinian state. Confronted with the consequences of sacrificing state-building for his own personal power, and his own inability to agree to any plausible peace deal with Israel, Arafat unleashed the Second Intifada which, as with all Arafat's resorts to violence, led to dead Palestinians (and rather fewer dead Israelis) and the Palestinian cause (yet again) going backwards, since it (including the Israeli responses) largely completed the process of reversing the building of effective Palestinian institutions. Having rejected Israeli Premier Ehud Barak's peace offer without making any serious counter-offer of his own, it is no wonder that it became bipartisan US policy to wait for Arafat to die. Said death (November 2004) finally allowing the Second Intifada to end. With an effective Palestinian state even further away, and Arafat's politics of patronage and corruption having rotted away Fatah's credibility, the openly genocidal Hamas decisively won the 2006 Palestinian elections. Which led to the further division of Palestine between Hamas-controlled Gaza and Fatah-dominated West Bank. With Hamas continuing the Arafat strategy of disastrous "victories". ... it’s better [that Palestinians] die in Syria than give up their right of return. Yet the current spectacle of ethnic, clan and other mayhem and massacre in Libya, Syria and Iraq (and the fragility of Lebanon) provides a daily grim spectacle of why Israeli Jews would be mad to agree to any state where they became the minority. That even without the memory of what happened to Jewish minorities in the rest of the Middle East. Nothing Hamas ever does, and little Fatah ever does, seemed to be seriously aimed in any way at convincing the Israeli electorate that a peace agreement can be had. By contrast, Nelson Mandela never seems to have lost sight of the fact that South African whites would have to be included in any final settlement. Mandela grasped that true victory was when the whites were no longer the enemy: there is no sign that the Palestinian leadership has ever even remotely grasped that. That contrast says all one has to say about the disastrous Palestinian leadership.